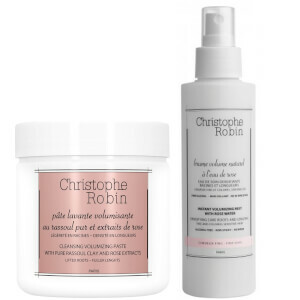 Create a full-bodied style with the Christophe Robin Cleansing Volumizing Paste and Instant Volumizing Mist. Combining a texturising paste and a body-enhancing spritz, the high performance duo allow you to achieve salon-worthy results from home. A deep cleansing, shampoo-like treatment with a unique consistency and volumising benefits. The 85% natural-based formula transforms into a lightweight foam, with pure Rassoul Mineral Clay (rich in trace-elements) working to absorb dirt, oil and impurities whilst enhancing strength, lift and thickness. Extracts of Baobab Leaf and Centifolia Rose Water provide antioxidant properties to help protect colour vitality. A leave-in, alcohol-free formula composed of 96% Rose Water. Ideal for fine, coloured and sensitive hair, the weightless mist delivers natural, long-lasting body, without leaving hair feeling sticky or heavy. Infused with a subtle, rejuvenating fragrance to uplift the senses. Pasta: con el cabello mojado: usar una cantidad de producto del tamaño de una cucharada (más o menos, según el largo del cabello), frotar en las palmas de las manos y aplicar por todo el cabello. Suavemente, realizar movimientos circulares hasta que se sienta que la pasta se transforma en espuma, y asegurarse de cubrir las raíces. Añadir un poco de agua, emulsionar y aclarar con abundante agua. Bruma: agitar antes de usar. Aplicar en raíces y largos antes de peinar el cabello secado con toalla o totalmente seco. Rociar sobre las raíces, levantando el pelo por secciones, masajear por el cuero cabelludo y asegurarse de que se absorbe por completo. No aclarar. Mist: Rosa Centifolia Flower Water, Aqua (Water), Polyquaternium-16, Hydrolyzed Adansonia Digitata Extract, Rosa Moschata Seed Oil, Rosa Gallica Extract, Parfum (Fragrance), Maris Sal (Sea Salt), Glycerin, Deceth-7, Peg-40 Hydrogenated Castor Oil, Ppg-26-Buteth-26, Guar Hydroxypropyltrimonium Chloride, Sodium Hydroxide, Disodium Edta, Citronellol, Geraniol, Linalool, Cinnamyl Alcohol, Methylchloroisothiazolinone, Magnesium Chloride, Magnesium Nitrate, Methylisothiazolinone, Benzyl Alcohol, Phenoxyethanol, Carbomer, Sodium Benzoate, Potassium Sorbate.